I have a penchant of declaring arbitrary celebration days (remember March Muffin Madness?). Last week, I wanted a reason to celebrate something so I declared April 29 The Official Dessert By Candy Strawberry Shortcake Day. Happy Strawberry Shortcake Day Everyone!! Okay, now that the greeting is out of the way, of course the only way to celebrate is by making and munching some delicious strawberry shortcake. Strawberry shortcake has always been a bit of a deceiving name to me because it is the furthest thing away from "cake". In fact, it's really a tea biscuit filled with macerated strawberries and cream. The basic premise is simple so it opens up lots of opportunities for interpretation. When I see all those containers of strawberries on sale at the supermarket, how can I resist bringing them home? However, I personally prefer to use a mixture of fresh and individually frozen berries. Nothing compares in flavour when the fruit is picked ripe at the height of the season but that is not always possible. Therefore, frozen berries offer a bit of consistency in terms of quality. A squeeze of lemon juice works wonders to brighten up the flavour. To fancy things up a bit, I added Grand Marnier. If classic is what you have in mind, chantilly cream is what you're after. It certainly is good but I adore the richness of creme anglaise (i.e. custard sauce). For my version of strawberry shortcake, I made a vanilla creme anglaise and dispensed it using an iSi Pro. The result is the lightness of a loose whipped cream combined with the yumminess of custard. The biscuit part is the most challenging. Though deceptively simple, there is also nowhere to hide so technique is everything (kinda like my love-hate relationship with pie dough). A tender biscuit requires a very gentle touch. However! If you do end up overworking the dough just a smidge, serving the biscuit warm can somewhat mask the toughness. Oh yeah, and drenching it with cream and syrup doesn't hurt either. I used the butter biscuit recipe from Rose Levy Beranbaum's The Bread Bible. It's an interesting recipe because it uses hardboiled egg yolks in the dough. The last time I worked with hardboiled egg yolks was in a linzer cookie dough. I have a long way to go to perfect my biscuit technique, sigh. 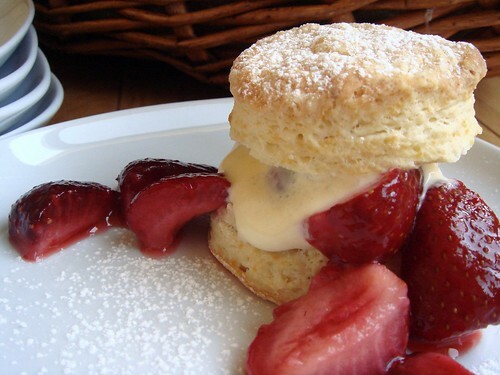 Just before serving, sandwich some strawberries and cream between a biscuit sliced in half. With a sprinkling of icing sugar and some fresh strawberries halves to garnish, this is one gorgeous dessert to kick off the beginning of summer! I had a rare day of leisure today because I somehow managed to squeeze in my two hour workout before my facial appointment. As soon as my appointment was done, I felt so thrilled to have a whole day ahead of me with nothing planned in particular. 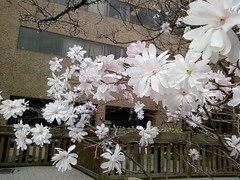 My first stop was J-Town in Markham for some Japanese treats and I saw this gorgeous shrub blooming with pale pink flowers. Spring is here at last! I saw some bottled pure yuzu juice on sale for $12 and I was very tempted to get a bottle. I wonder if it has enough acidity to make a yuzu curd? My next stop was Metro Square, a place that I have not returned in years. I used to shop there very often because of the Taiwanese grocery store. Since that store was gone, I don't really have a reason to visit. I don't know what came over me today but I decided to drop by just because. I'm sure glad I did! There is a bookstore which specializes in books published in Taiwan. 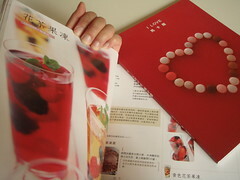 Taiwanese publishers have, for many years, done a great job of translating many Japanese-authored cookbooks to Chinese. With such a vibrant pastry scene, the dessert cookbooks from Japan range anywhere from intricate to innovative, but always very attractive. 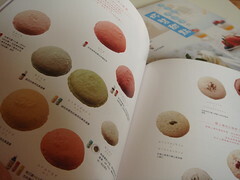 These cookbooks are characterized by the colourful step-by-step pictures as well as the marriage of Japanese flavour/ingredients with French pastry. My two new acquisitions are "I Love Maracons" and "Dessert In A Glass". Macarons used to be some mysterious French treat that appeared impossible to attempt in my own kitchen. Of course the mystery ceased to exist once I figured out how to duplicate them with my own two hands. However, macarons continue to be a finicky thing to make. This cookbook devotes entirely to macarons wtih step-by-step instruction, tips for troubleshooting, flavour variation, filling variation, packaging idea, and even recipes to use up the leftover egg yolks. It makes me happy just flipping through the pages. "Dessert In A Glass" is a topic dear to my heart. Ever since my introduction to Pierre Herme's Emotion series of dessert, I've fallen in love with creating dessert in a glass filled with layers of constrasting taste, texture, and colour. 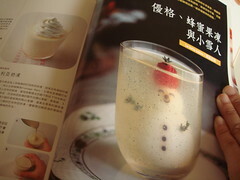 This cookbook offer many inspiration such as the snowman in honey yogurt gelee on the left. I picked up some cool technique including making homemade "tofu" by shaping a gelatinous mixture with a piece of Saran wrap and setting it in an ice bath. There are also discussion of different setting agents that introduced me to all the different root starches used in traditional Japanese dessert. I am very excited to try every one of the recipes in this book! I've been very worry about EG. However, since we are not even on speaking terms, I did what I thought was appropriate in this situation. 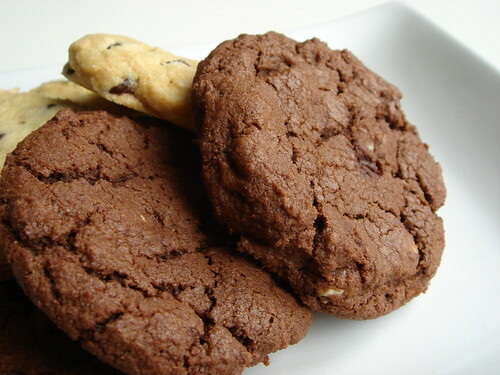 I baked him a batch of cookies attached with a heartfelt note and left it at the mailbox of his house. Unfortunately, stupid little me forgot one very important fact. If the cookies did not get picked up yesterday and was left outside all night, chances are they would get hijacked by racoons and squirels in the area. Sigh. A rum cake is one of those omiyagi (roughly translated as souvenirs for friends and coworkers) that my coworkers favour after a work trip to the Caribbeans. Coincidentally, I am a huge fan of this treat but since I do have some good manners, I know better than to take a huge slice every time a rum cake is passed around in the office. In my mind, having a big rum cake all to myself definitely ranks right up there on my wish list. On second thought, I am quite competent in the sweet kitchen so why not make my own? It's not like I can't get my hands on the ingredients easily. If you search for rum cake recipes on the internet, one very typical version that turns up in the search actually involves making use of packages of instant vanilla pudding mix. However, the basic premise is simply a rich butter cake soaked with rum syrup. The alcoholic syrup obviously serves as a preservative because these type of cakes are better after aging for a period of time. The flavour slowly matures and mellows out. The following recipe is my version of rum cake. It is moist, tender, and oh-so rum-my! Now I don't have to wait for the next omiyagi at the office to get my rum cake fix. Preheat oven to 350F. 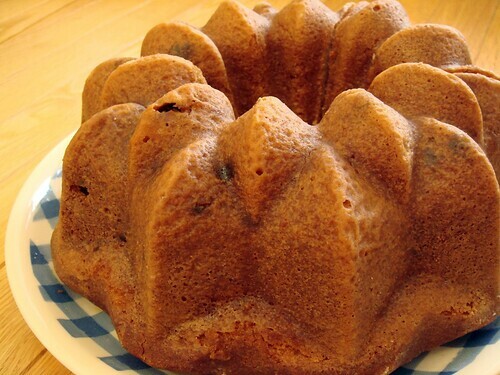 Grease and flour a 9-cup Bundt pan. In a medium bowl, combine eggs, a quarter of the sour cream, and vanilla extract. In the bowl of a stand mixer, combine flour, almond, sugar, baking powder, baking soda, and salt. Mix on low using the paddle attachment for 30 sec until thoroughly combined. Add butter and remaining sour cream to the flour mixture. Mix on low until all the ingredients are moistened. Turn up to medium speed and mix for 1 1/2 min. Add the egg mixture in three batches, mixing on medium for 20 sec in between to ensure ingredients are incorporated. Gently fold raisins into the batter. Fill the prepared cake pan with batter and bake for 55 to 65 min until a cake tester comes out clean. While the cake is baking, stir together sugar and rum to make rum syrup until sugar is dissolved. I prefer not to heat this syrup to dissolve the sugar because I do not want to evaporate any of the alcohol. Once the cake is out of the oven, poke holes all over and brush with half of the syrup. Let stand on wire rack for 10min before unmolding to serving plate. Brush the top of the cake with remaining syrup. Cool completely before storing in airtight container. Wait at least 12hr before eating to allow the flavour to mature.